Post-boxes, hydrants and lampposts are much loved by dogs. For an evening last week, I let my inner dog loose and spent one hour running around suburbia looking for the aforementioned street furniture as part of a Street-O event. 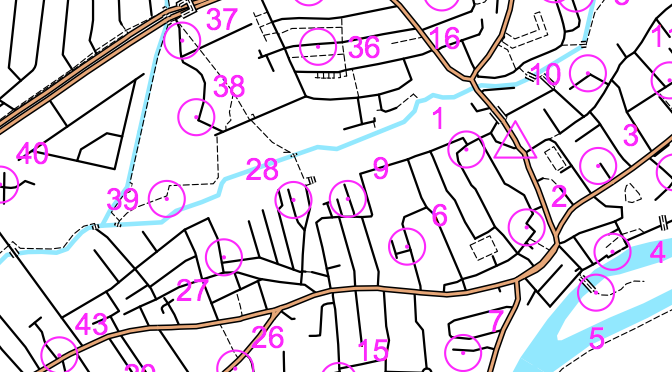 A week ago, I hadn’t heard of Street-O when my friend and coach Marc Woodall suggested I join him for an event in Stoneleigh, hosted by the Mole Valley Orienteering Club. “Meet in a pub next to the station”, he said. Sounds informal, I thought, and it is. Turning up at the pub I was met by two guys sat in the corner, pints on the table, distributing maps. Informal is a complement by the way, not a criticism – and the welcome could not have been friendlier to a newcomer. Once we had paid the £3 fee and had our map, we were off. Marc kindly let me join him for my inaugural event as a Street-O virgin. Turns out it’s akin to an urban orienteering race. The map you are given is of the local area, but without street names or other helpful information. You run with the aim of getting to specific locations (“controls”) on the map, generally under street lights. On the other side of the map you will be given a list of controls with numbers as stated on the map overleaf. There will be clues, such as “hydrant (lower number)”, with the objective to identify the correct hydrant and thus write down the said lower number on the sheet. The controls are divided up into three point values – 10s, 20s and 30s. So, ideally, you would spend a few minutes identifying the smartest route to get the highest score achievable. Needless to say, as runners Marc and I simply ran off in one direction towards a plethora of controls on the map – probably a common tactic by organisers to flummox competitors. It was clearly a mistake and limited our scoring potential. You have one hour to score as many points as possible, and need to judge how far you are away from ‘home’ (the pub) to ensure you don’t go over the time limit and get penalised points. As Marc and I had headed off on a sub optimal route (with me failing to add any strategic value throughout), we settled for our lot with several minutes left on the stopwatch as we knew we wouldn’t get to the next control and back on time. Instead, we had a quick pint while awaiting our results. It was at this time I realised the genius in hosting such events at a pub! I was quite pleased to have finished in joint 7th for my first time at such an event. I will definitely do more of these and continue my dog impressions in suburbia. Not only is it a strategic challenge, but it’s fabulous interval training because you have to stop to write down an answer, before speeding off towards the next control. While moving, we averaged 6.49min pace for the 6.5miles we covered, so we were not hanging around. The biggest lesson I took away was the need to try new things. If Marc hadn’t mentioned it to me there is no way I would have been at a random pub on a cold November evening having great fun on what is essentially a treasure hunt for grown-ups who like to run. If you want more information on Street-O, please check out http://www.mvoc.org/ and http://slow.org.uk/about/streeto/.